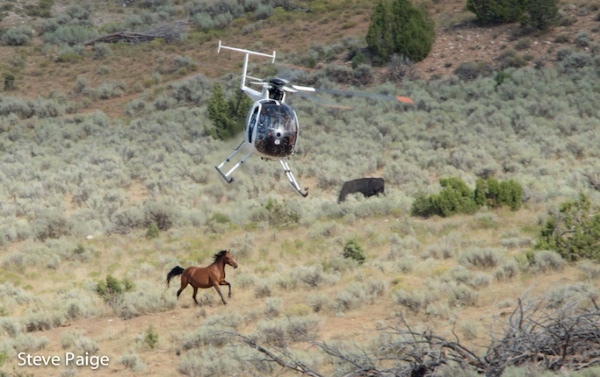 A BLM contractor’s helicopter pursues a stallion as cattle graze undisturbed during a 2016 roundup at Blawn Wash Herd Management Area in Utah. RTF file photo by Steve Paige. On Aug. 16, the U.S. Government Accountability Office Accountability Office released a 34-page report on America’s horses, wild and domestic. Unfortunately, this U.S. Government Accountability Office report represents more time and money spent by Congress without holding the Bureau of Land Management responsible for decades of wild horse mismanagement or taking a stronger leadership role in creating a humane, sustainable vision for wild horses on our shared public lands. In 2007, BLM stood within 1,071 wild horses and burros of its own population goal, yet failed to implement the fertility control vaccine program for which Return to Freedom and others have long advocated. Instead, BLM has never spent more than 4% of its Wild Horse and Burro Program on fertility control. The agency continued hiring contractors to capture wild horses and place them in expensive off-range holding facilities – a practice that the National Academy of Sciences in 2013 actually blamed for increasing reproduction on the range. Now, BLM is attempting to paper over its own mistakes with budget proposals that include allowing the agency to euthanize – shoot – healthy, unadopted animals in which American taxpayers have invested millions of dollars. Sadly, some in Congress are prepared to let BLM do just that, despite polls showing that 80% of Americans oppose horse slaughter and a similar percentage want to see wild horses protected. The GAO report does make a case for the passage of the Safeguard American Food Exports Act, however, noting that more than 100,000 American horses are exported to Mexico and Canada annually for slaughter. Because Americans do not raise horses as livestock, they are often given hundreds of medications dangerous, even deadly, when ingested by human beings. The bipartisan SAFE Act (H.R. 113 / S. 1706) would place a federal ban on slaughter and the transport of horses for slaughter for the good of horse and human health. It’s time for Congress to pass the SAFE Act — for the good of all American horses and for human health — and mandate that BLM immediately invest in safe, proven and humane wild horse management tools.